If, despite having booked a certain flight and turned up at check-in on time, you are not permitted to board or your flight is cancelled or delayed by more than three hours, this is always annoying and involves considerable inconvenience for you and your travel companions. In certain cases, you may, for example, miss an important business appointment or long-awaited family celebration. We help you to claim your right in German courts and can assist you regardless of where you live – in case of success completly free of charge! WHAT DO YOU NEED TO DO TO GET YOUR COMPENSATION? We recommend that you first write to the airline yourself and set a deadline for payment. In our experience, the airline will not react to this letter or will reject it. For your convenience, we´ve provided a sample letter, which you generate by using our Warning-Generator. If you have any questions regarding the Warning-Generator, please feel free to contact us anytime. Once the deadline has passed without payment, you should contact us. After we have set a further deadline, which, in our experience, will also be ignored, we will then lodge the lawsuit on your behalf so that you can get what is due to you! In order to prevent a long, drawn-out process, airlines generally pay upon lodging of the suit or acknowledge the suit shortly before the deadline for verbal negotiation. Please send us an original copy of the declaration of power of attorney. All other documents can be sent as a copy by post, fax or e-mail. You can easily determine the distance between your departure and your destination airport using the distance-online-calculator provided under www.luftlinie.org. As every passenger has a right to claim compensation, a four-person family can quickly reach compensation of 2,400 EUR for a flight distance of more than 3500 km.If the airline offered you an alternative flight, the amount of your entitlement to compensation may be reduced by 50%. The deciding factor is how much the arrival time of the alternative flight deviates from that of the original flight. A reduction of 50% is only possible with a deviation of up to two hours under no. 1, up to three hours under no. 2/3 and up to four hours under no.4.Alongside the entitlement to compensation, depending on the individual case you may also be entitled to compensation for rebooking, accommodation or cancellation costs. In accordance with EC Directive 261/2004, passengers are entitled to compensation in the case of delays of three hours or more or a flight cancellation (cancellation of a flight without replacement). To determine the duration of the delay the initial departure time and the time at which the aircraft has opened its doors after landing is decisive (see ECJ, judgment of 09.04.2014, Case-No. C-452/13). This only applies insofar as you have begun your flight from an airport within the European Union and the delay is not due to acts of force majeure. Force majeure includes, for example, the effects of the weather and strikes by pilots or on-ground or safety staff. You may also be entitled to compensation if you have booked a flight and turned up at check-in on time but the airline refuses to transport you and does not give a good reason for this. 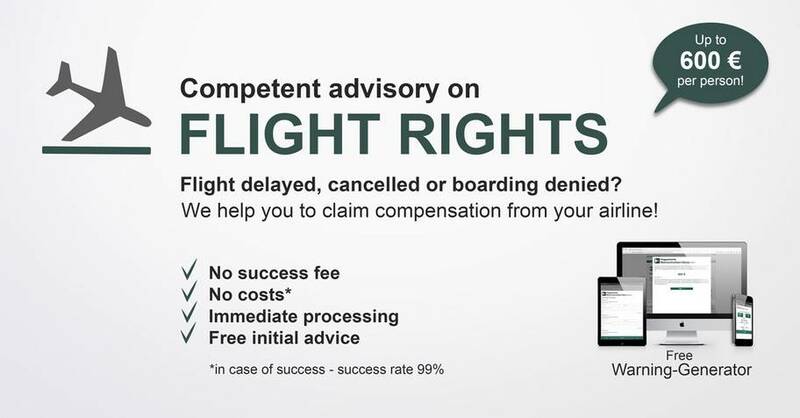 Should these conditions be met, the airline is obligated to pay you compensation immediately. How much will it cost to assert your claims? You will not incur any costs for asserting the claim for compensation if you are successful. Unlike commercial providers, we do not charge any commission. These providers often keep a share of up to 30% of the compensation in the event of success. DIEKMANN Rechtsanwälte initially invoices the statutory fees directly to you. If you are then successful, you will receive the full compensation. In addition, the airline must reimburse your expenses. This means that you actually incur no costs at all!